Photo via twinkletuason on Flickr. 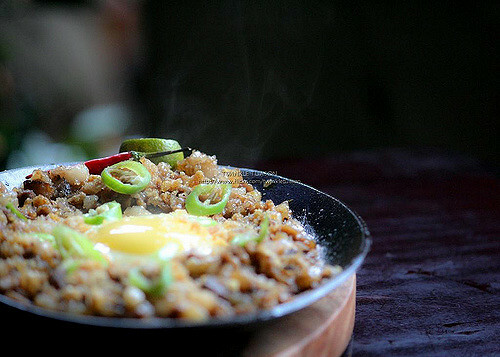 Sisig - crisp, crunchy pork jowls and belly served on a sizzling platter with a raw egg broken on top, calls to mind rowdy, evening-to-early-morning drinking sessions, otherwise known as inuman. Typing these words makes me yearn for home. As a departure from that, however, the reason I thought about sisig tonight is that it reminded me of a dear friend of mine, whom we lost too soon. I received my copy of Colorless Tsukuru Tazaki today, and as a dedicated Murakami fan, promptly sat to begin my journey into his latest world after dinner. The first few pages of the book talk about Tsukuru, and four of his best friends from high school. I won't be giving anything away by saying this (as I myself am on page 16), but within that span, a flood of memories rushed quickly. I had a friend named JP who passed away in 2008, and we both read Murakami. He often took the bus home with me, through a slightly farther route than was necessary for him to get home, mostly to hang and talk. Murakami's description of Tsukuru's group of friends reminded me so much of what my friends and I used to do, and as it always does with his books, I mirror the introspectiveness of Murakami's characters. I went to one of Manila's best culinary arts colleges, across one of the largest universities in the Philippines, at an amazing school with a bunch of eager cooks and fun people studying to be chefs, five-star hoteliers and travel professionals. JP was in my freshman class, and we stayed good friends through the next four years. I remember exactly what I was doing the night I got the call from a friend telling me of his passing. I have never before or since felt such an overwhelming current of sadness and loss. Thinking back with what I know now about mental health and depression, it surprises me that that possible connection has just crossed my mind. There is still a ways to go in the Philippines towards understanding the tenets of depression as a kind of sickness - towards understanding the symptoms of it, and towards educating people about how to act and speak openly with people who exhibit tendencies towards it. One of the great, wonderful powers of the internet is that in shrinking timespans, I believe it really won't be long before dialogue around touchy subjects - such as clinical depression and sexuality/gender biases - spreads and encourages discussion amongst people, with respect to each others' views. Moving back to sisig - that was something JP often had for lunch, at the little car park turned outdoor cafeteria that was right outside our college's main building. Squeezed in between a 20-storey school/hotel and a row of very cramped two-level houses that housed what looked like four families at a time, kids poured into that tiny space - the closest decent lunch spot where the ladies who ran it knew exactly what you wanted. There was always someone making an order (or four) of sizzling sisig; the second you stepped out the air-conditioned doors of the college, waves of soy sauce and calamansi-flavoured pork belly and cheek bits wafted through the air, assaulting your senses and reminding you that yes, you do want that with a bowl of steaming white rice (though sisig is more commonly served as pulutan). JP would crack two eggs on top of his platter, add a smattering of red chili-infused oil, and proceed with teasing someone till they playfully punched him, or else talk about soccer, which he unfortunately found not much of an audience for in our group. I guess that's what took us by surprise most about his passing then - that we knew him as a cheerful person, someone who was generous with his time and always a caring, thoughtful listener. We dismissed things he talked about as simply odd, and found it offbeat that he spent so much time reading books about subjects I never bothered to look closely into - not realizing how he might have felt alone, and deeply hurt with no one being unable to understand his experiences. To JP, I and many people miss you greatly. I'll share this story the next time I make some sisig.